Lillian Gilbreth’s Kitchen Practical: How it reinvented the modern kitchen. Purdue Libraries’ Archives and Special Collections. The idea that housework is work now seems like a commonplace. We contract it out to housekeepers, laundromats, cleaning services, takeout places. We divvy it up: You cooked dinner, I’ll do the dishes. We count it as a second shift, as well as primary employment. But it wasn’t until the early part of the 20th century that first a literature, and then a science, developed about the best way to cook and clean. The results of this research shape the way we treat housework today, and created a template for the kitchen that remains conceptually unchanged from the 1920s. And the woman who made the kitchen better? She couldn’t cook. If that sounds like the set-up for a comedy, that’s because it was. 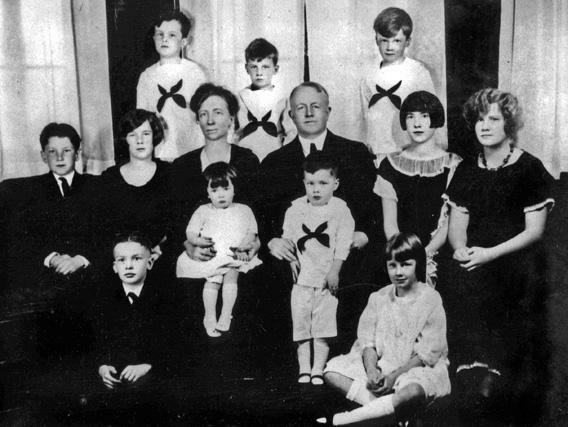 Lillian Moller Gilbreth, industrial psychologist and engineer, was the mother of 12 children. She and husband and partner Frank B. Gilbreth, inventors of what is known as motion study, pioneered the use of short films to watch how industrial processes and office tasks were done, breaking them down into component parts (which they called “therbligs,” Gilbreth backward) to determine how to make a job faster and less taxing. They tested many of their ideas on their children, establishing “the one best way” to take a bath, training preteens to touch type, and charting age-appropriate chores for each child. The ensuing hijinks provided enough material for memoirs written by two Gilbreth children, Cheaper by the Dozen and Belles on Their Toes. Harris & Ewing/ Smithsonian Institution Archives/Wikimedia Commons. While Frank Gilbreth was alive, he and Lillian worked for industry. She wrote or co-wrote many of his books, but often took no credit, as it was Frank with whom the male executives wanted to deal. After his sudden death in 1924, she had to re-establish herself as a solo female practitioner. According to biographer Jane Lancaster, in Making Time, Gilbreth soon saw that combining her professional expertise on motion study with her assumed expertise on women’s work gave her a marketable niche. If the only way to enter a man’s field was through the kitchen door, that’s the way she’d enter… Mother planned, on paper, an efficiency-type kitchenette of the kind used today in a good many apartments. Under her arrangement, a person could mix a cake, put it in the oven, and do the dishes, without taking more than a couple of dozen steps. It had to be cake, because that was one of few dishes Gilbreth made well. Gilbreth had grown up in an upper class household in California with a Chinese chef. She had worked side-by-side with Frank Gilbreth from the day they married. As she told a group of businesswomen in 1930, “We considered our time too valuable to be devoted to actual labor in the home. We were executives.”And family councils, at the Gilbreth home in Montclair, were run like board meetings. Even though she did not do it herself, Gilbreth still considered housework unpaid labor, and as such, capable of efficiencies. The worker in the kitchen in the 1920s was often not a servant but the lady of the house, who spent an estimated 50 percent of her day there. The refrigerator had begun to arrive in middle-class homes, but was the subject of a pitched battle between gas and electric companies as to who made the superior chiller. Smaller electric appliances were also in development. 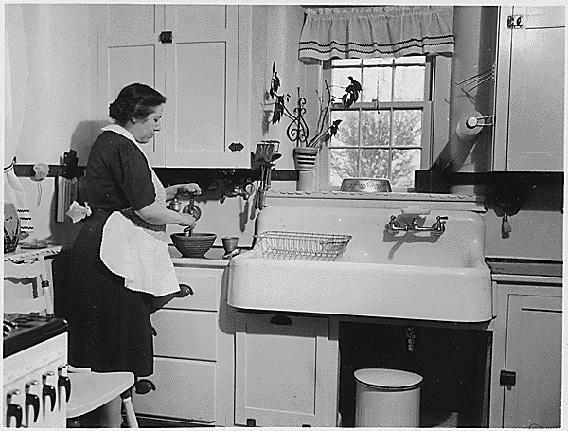 “Home economists” raised the bar for domestic health and hygiene. Women became the targets of intense marketing campaigns for products large and small. Gilbreth worked for these manufacturers, and thus is complicit in the rise of consumerism for the home, but she never made explicit endorsements. She did, however, partner with the Brooklyn Borough Gas Company to develop Gilbreth’s Kitchen Practical, unveiled in 1929 at a Women’s Exposition. The kitchen was intended to showcase the new gas-fueled appliances as well as Gilbreth’s research on motion savings. It was to replace the loose-fit kitchen of many traditional homes (including the Gilbreths’): a large room with discrete pieces of furniture around the edges. These might include a table, a freestanding cupboard or Hoosier cabinet, an icebox, a sink with a drying board and a stove. Ingredients, utensils and cookware might be across the room, or even in a separate pantry. The test of the efficiency of the new kitchen was made with strawberry shortcake…The cake was first made in a typically haphazard kitchen…Then an exactly similar shortcake was prepared in the Herald Tribune Kitchen, which has the same equipment and utensils as the other kitchen, but has them arranged for efficiency. The results of this test were so startling as to be almost unbelievable. The number of kitchen operations had been cut from 97 to 64. The number of actual steps taken had been reduced from 281 to 45—less than one-sixth! In our current era of FitBits and FuelBands, saving steps may not sound like an unmixed blessing, but the manual had a clear position on where those steps should be taken. The [Herald Tribune] Institute is not opposed to walking and exercise for the woman of the family far from it! But we do maintain that she should take that exercise in the open air, rather than in a treadmill round of refrigerator to sink, to stove and back again. In the 1940s, what Gilbreth called “circular routing” became known as the kitchen “work triangle,” a concept that designers still rely on today. In an efficiently planned kitchen, the perimeter of the triangle formed by stove, sink, and refrigerator should be no greater than 26 feet, with a typical distance of 5.5 feet between appliances. Gilbreth’s rolling cart has largely been eliminated from contemporary kitchen design, likely due to the increase in counter space. 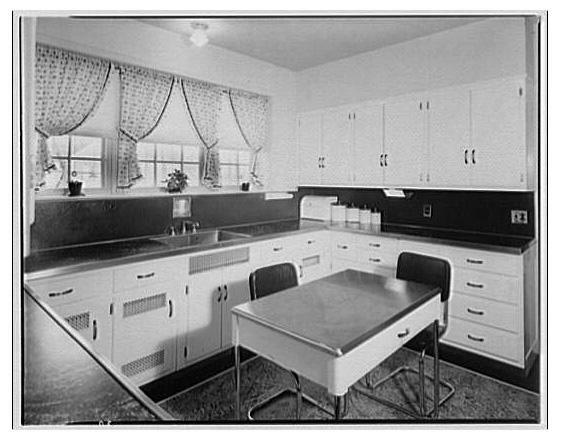 Our “continuous kitchen” with sink, stove, and cabinets harnessed into one larger unit by a solid surface—the refrigerator remains an outlier—developed in the late 1930s. A Pardoe kitchen, inspired by Gilbreth’s Kitchen Practical design, by the Kitchen Equipment Co. Photograph by Theodor Horydczak/Library of Congress. It is a tragedy and a reproach that for hundreds of years feminine backs have ached so unnecessarily. … As the result of the work of women like Dr. Gilbreth, all up-to-date kitchen equipment will probably in time be made with easily adjustable legs, but until that time comes there are various expedients by which the housewife may meet the difficulty. Stand in front of your kitchen counter, shoulders relaxed, elbows bent. If you are 5 feet 7 inches tall, your hands should hover just above a work surface set at a standard 36 inches high, ready to chop, slice, or stir. If you are shorter than that (as the majority of American women are), you will have to raise your elbows laterally like wings, to get your whisk into position. If you are taller than that (as the majority of American men are), you will have to lean down in order to apply proper pressure on the knife. 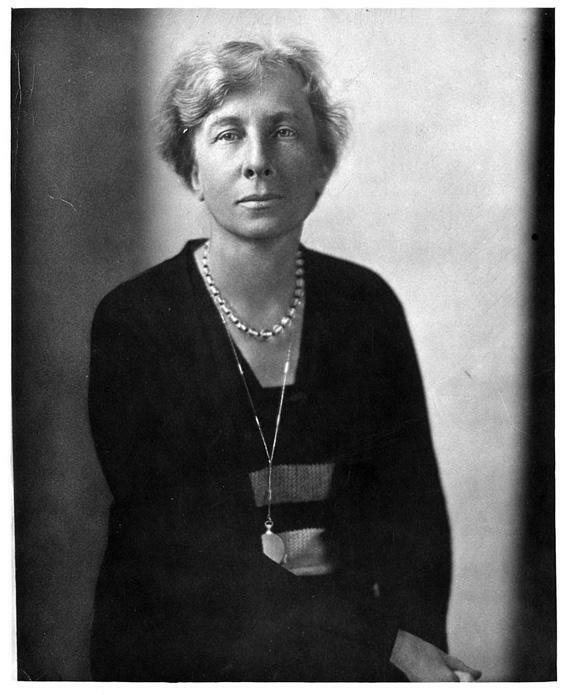 In the case of counter height, Lillian Gilbreth did not have her way. Manufacturers found it easier to standardize. Gilbreth’s final contribution to the kitchen as workspace is the Gilbreth Management Desk, exhibited by IBM at the Century of Progress Exhibition in Chicago in 1933. As the Better Homes Manual put it, “It is Dr. Gilbreth’s belief that the business of running a house demands a well-planned little ‘office’ just as surely as does any business run by a man.” The desk had drawers for bills paid and unpaid, a shelf for cookbooks and a nook for a telephone. A toolbox was close to hand. And there was a radio. The radio, more than any other element, speaks to Gilbreth’s psychological training. The point of all this efficiency, after all, was to make the work of home-keeping just one part of a woman’s life. The life of the mind, and the outside world, should not be alienated or separated from homemaking. Efficiencies should make time for other pursuits, and technology could allow you to think about other things, even while washing dishes.